Eggplants may be my favorite summer vegetable. Perhaps that’s because I have such fond food memories of my grandmother’s parmigiana di melanzane, or Eggplant Parmesan. The parmigiana is a lot of work, though, a dish for special occasions, so I’m always looking for different ways to prepare eggplant. 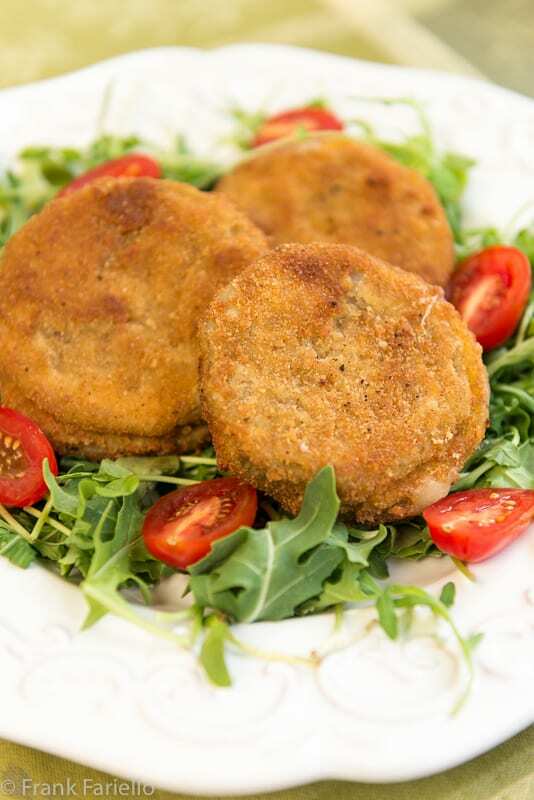 One of the simplest and most appealing I’ve encountered are Eggplant Cutlets, eggplant slices breaded and fried just as you might veal or chicken. Today’s dish, Eggplant Cordon Bleu, or Cordon bleu di melanzane, takes that simple idea and kicks it up a notch. 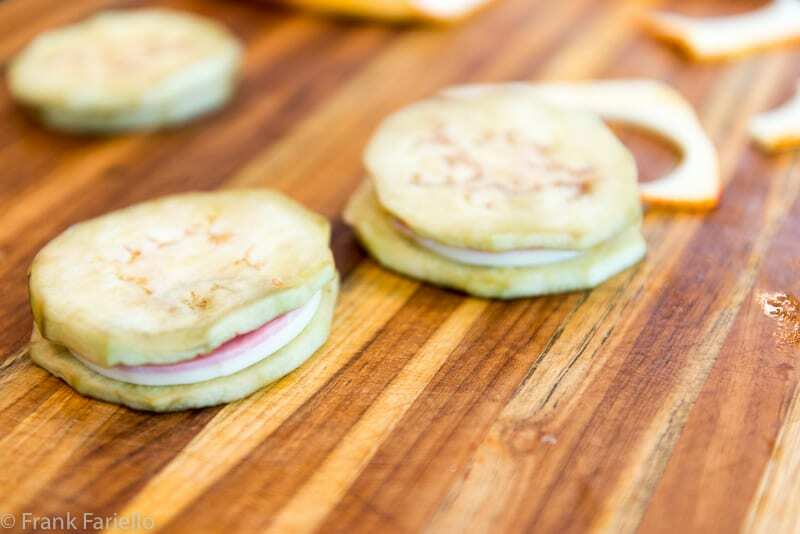 You insert slices of ham and cheese between two slices of eggplant to make a kind of ‘sandwich’, which is then breaded and fried as you would regular cutlets. Crispy on the outside, creamy and savory on the inside, Cordon bleu di melanzane is sure to please just about anyone, even those who aren’t keen on vegetables. I think Eggplant Cordon Bleu are best served as a semi-vegetarian second course. And like their meaty counterparts, Eggplant Cordon Bleu go very nicely with a green or mixed salad as a side. Now make “sandwiches” by placing one slice of ham and one of cheese in between two slices of eggplant. 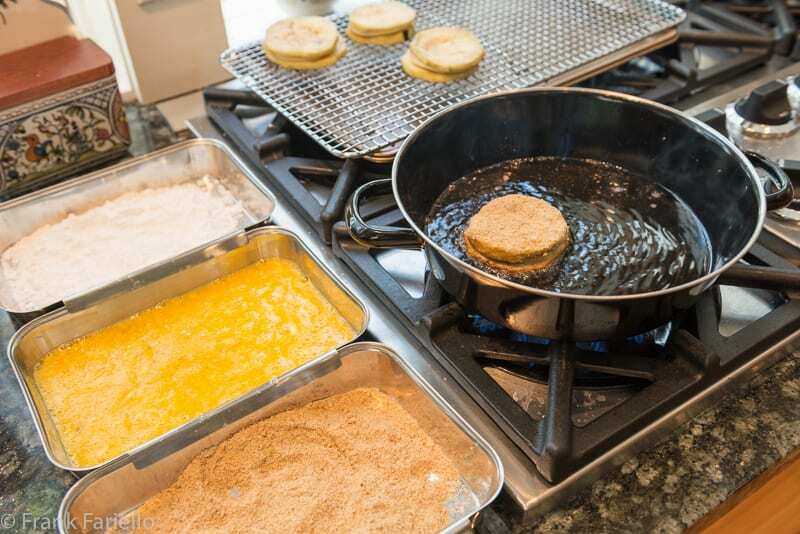 Proceeding as if you were making a cutlet, dip these sandwiches in flour, then in the beaten egg—which you will have seasoned with salt and pepper and, if you like, a bit of grated Parmesan cheese—then finally in the breadcrumbs. At each step, make sure to cover the sides as well as the tops and bottoms of the sandwiches. If there are any bald spots, you can repeat the process. 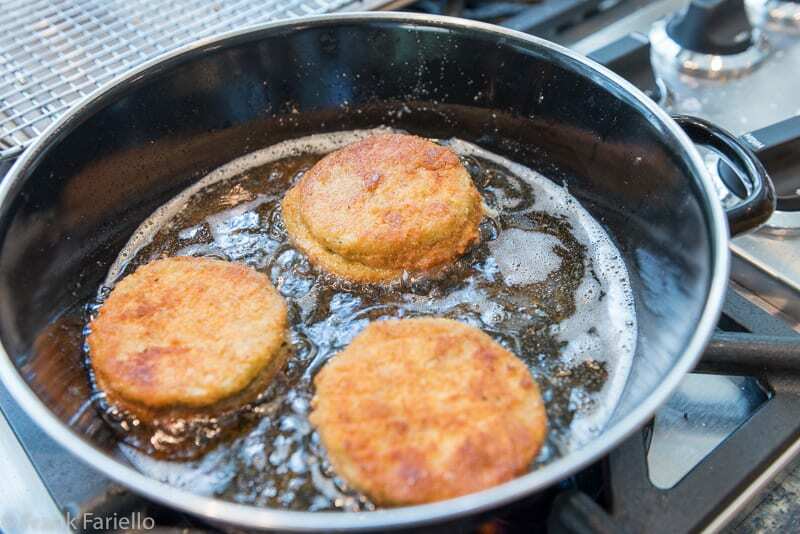 In a large frying pan, fry the eggplant slices in olive oil, enough to come about 1 cm (1/8 inch) up the sides of skillet. The oil shouldn’t be too hot, just hot enough to bubble gently around the sides of the sandwiches. Take your time with it. Otherwise, the outsides will brown before the eggplant has time to fully cook. Lay the fried slices out on a baking rack or on a platter lined with paper towels. When you’ve finished frying all of them, serve them right away. The good, old-fashioned large, elongated variety of eggplant are ideal for making Eggplant Cordon Bleu. They produce a fair number of even slices of the size you need to make a proper cordon bleu. Round eggplant tend to be a bit too long around the middle, baby and Asian eggplant too small. It used to be that this kind of eggplant (at least those sold here in the US) had to be peeled because their skins were tough and nearly inedible. That’s mostly no longer true, but for this dish, I would recommend skinning anyway, The breading tends not to stick to the glossy skin, and you do want breading all around your cordon bleu. These days most young eggplants don’t need purging in salt, either, which used to be necessary to eliminate bitterness. I would still recommend it for making Eggplant Cordon Bleu. The initial purging softens the eggplant, which helps make sure that the eggplant cooks all the way through. And that’s the trickiest part of the dish. Underdone eggplant has a rubbery texture that makes for pretty unpleasant eating. Since the eggplant in this dish is only expose to the heat of the oil on one side, there’s a risk that the eggplant won’t cook through unless you take care. Some recipes play it safe and have you cook the eggplant slices on both sides beforehand, either by frying them in olive oil or searing them on a griddle. But if you slice the eggplant thin enough, purge the slices in salt to soften them, and then take care to fry them slowly enough, they should turn out perfectly tender. The trickiest part of this dish is making sure the eggplant slices cook all the way through. The most common cheeses for making Eggplant Cordon Bleu are formaggi di pasta filata, or ‘spun paste’ cheeses: scamorza, mozzarella, caciocavallo or a mild provolone. If you’re using fresh mozzarella, make sure to drain it well beforehand. Actually this is one dish where the dry kind of mozzarella works rather well. Otherwise, any good, mildly-flavored melting cheese will do: Emmenthal or fontina, for example. In this case, I used munster and it worked just fine. As for the ham, most recipes simply specify prosciutto cotto, or cooked ham. Here in the States, we have any number of cooked hams to choose from. You can use the one that you like best, but I would avoid honeyed hams. Their sweetness would clash, in my opinion, with the other flavors. I imagine prosciutto crudo or another cured pork would be nice as well. You can prepare your Eggplant Cordon Bleu ahead and reheat them in the oven when your ready to eat. They should take only a few minutes at 150C/300F. They will not be as good as freshly cooked, but they wont’ be too bad, either. Peel the eggplant and cut it into thin rounds, not more than 1 cm (1/8 inch) thick. Sprinkle the slices with salt and lay them in a colander placed inside a bowl or on top of a plate. Place a small plate on top of the eggplant and then weigh the plate down with something not too heavy like a small can. Let the eggplants rest for a good hour or so, then pat them dry and lay them out on a cutting board. 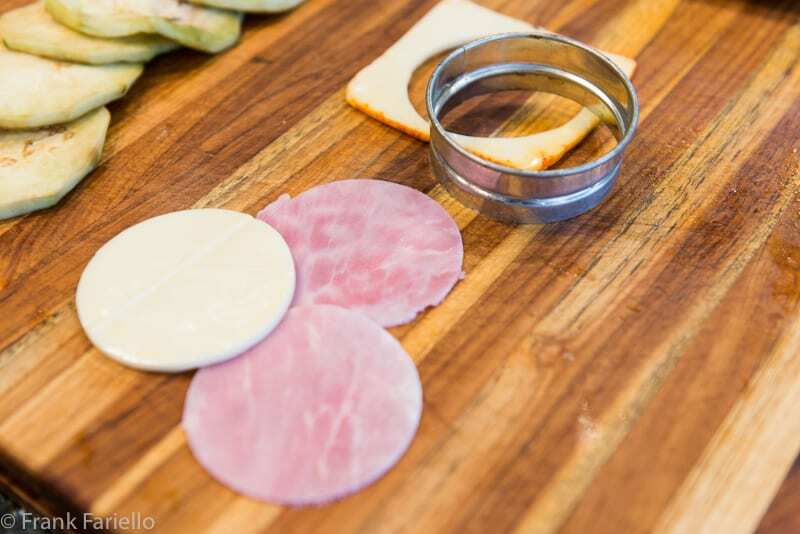 Then cut the ham slices and cheese slices into rounds slightly smaller than the eggplant slices. Now make "sandwiches" by placing one slice of ham and one of cheese in between two slices of eggplant. In a large frying pan, fry the eggplant slices in olive oil, enough to come about 1 cm (1/8 inch) up the sides of skillet. The oil shouldn't be too hot, just hot enough to bubble gently around the sides of the sandwiches. Take your time with it. Otherwise, the outsides will brown before the eggplant has time to fully cook. Lay the fried slices out on a baking rack or on a platter lined with paper towels. When you've finished frying all of them, serve them right away. This is truly a fantastic dish Frank! Thank you for the recipe and the tips as well. You’re right; a thin layer of eggplant will ensure it’ll be cooked through. We loved the weight thing as well, we haven’t tried it before, but it makes perfect sense. I have 6 melanzane from Venezia which are 2 cm around and about 35 cm long. Do you know what they are called and how to best cook them? Not sure about the name but personally I would prepare them a funghetto, to make the most of their delicate flavor. Enjoy! heavenly! my mum made it with cheese only, then baked it, but the concept is very similar. I could have a plateful just now, thanks for refreshing the memories Frank! Oh what a delicious recipe. I had never thought of combining eggplant with ham and cheese but I can’t wait to try this. It’s a bit of work, but definitely worth a try! I have a confession: the only way I eat eggplant is pickled, the way Nonna used to make it, with garlic, oregano and oil! However, this looks rather enticing, and I think I make actually like it done the Cordon Bleu style! Will have to try this as I know my family would love it! I bet you would. Truth be told, the presence of the eggplant is very subtle. Its mild taste is really just a foil for the ham and cheese stuffing. That’s what I was thinking! Must try! Frank this is brilliant, I’m making this for sure! Thanks, Marie. It’s a bit of work, but definitely worth it! I also like to add a thin slice of fried polenta with the cheese(gorgonzola), a ham or mortatella di bologna. As you say Frank, is better to take off the skin for a better cooking, I also like the idea of cooking just one side of the egg plants as Leonardo Ciampa suggest, nice tip, thanks Leonardo. And Thanks a million Frank for keeping us on our toes….Regards. Vittorio. The eggplants are starting to be stacked in the local markets and I am always searching for alternative preparations. Looking forward to serving this as an entree with a nice salad. Looks fantastic, Frank – and I will definitely be trying it, though the tomato tonnato is coming first this weekend! What a great idea, Frank! Looks fabulous! Oh boy! After looking at your delicious recipe and reading about, our breakfast is really bland. Of course, oatmeal on the best of days is pretty bland. 🙂 I really love the idea of stuffing the two slices of eggplant with the meat and cheese – yum! Great recipe, Frank! Buona giornata! ogni tanto un buon fritto fa bene sia al corpo che allo spirito, che piatto goloso !Buon weekend Frank ! I ADORE this dish! It is relatively popular in Sicily. The way I avoid the danger of undercooking the eggplant: before breading, I fry them on one side only, and when I make the sandwiches, the cooked sides are on the inside. In other words, the cold cuts touch the cooked sides. The raw sides are external. Then I do the flour-egg-breadcrumb thing, and fry them. 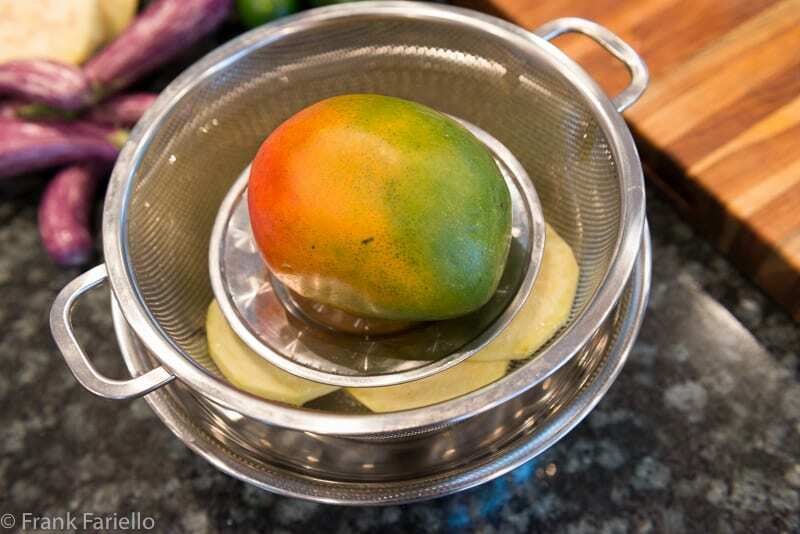 The raw sides get fried, and the inside has already previously been fried. For the fillings, I love your idea of a cookie-cutter! I’m going to try that! I personally like Emmentaler and black forest ham. Genius idea, Leonardo! A great compromise between fully pre-cooking the eggplant and not pre-cooking. And your stuffing choice sounds very tasty!